Okay, you’ve heard it by now. Organic Reach is dropping for three of four brands on Facebook. Dozens of bloggers are latching on to the frenzy and confusion with link bait articles about why you should jump ship ASAP. Maybe Facebook is no longer right for you. But if you abandon your efforts there, do so because of substantive evidence associated with your own results — not because a blogger’s panicked headline moved the needle. 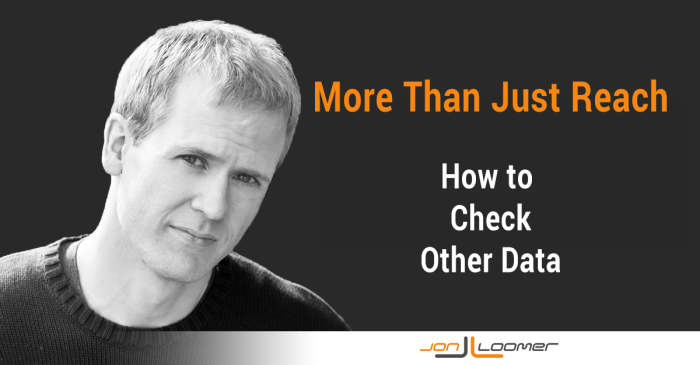 The purpose of today’s post is to help you evaluate whether your metrics that matter have taken a hit. This dust-up came at a very inopportune time since many brands (barring a few exceptions due to niche) are about to see a drop in Facebook and website numbers. That’s typical as users begin taking their holiday vacations, and their activities online drop. The past two years, my website traffic always drops in the second half of December. And that is again the case this year, even though I was on pace for a record month until December 20. So first, let’s not pay much attention to anything from December 20 and on. We should expect those numbers to drop (again, barring a few exceptions). Second, keep in mind that you should never pay too much attention to your stats in real time. Don’t compare this week to last, for example, because your stats for this week are not complete. Since general consensus seems to be that a drop in Organic Reach started on or around December 2, let’s use the time from December 2 – 15 as our test sample to determine if drops have occurred in important stats. Go into your Admin Panel and click the See Insights button at the top (this is one of a few ways you can access this data). 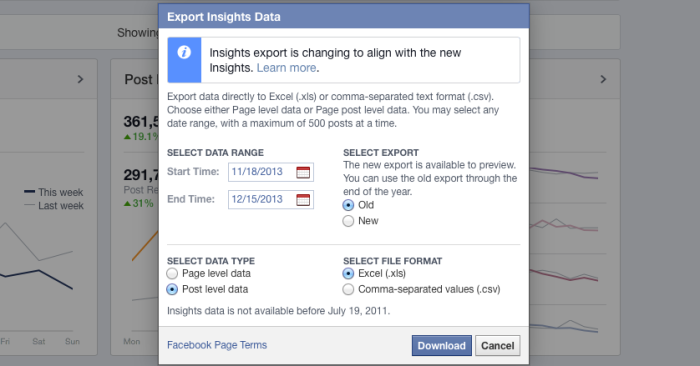 You will now be given a dialog to choose the data you want to export. Make sure to select “Post level data” as data type. I still use the old export while it’s available (it really shouldn’t matter for this study). And I suggest using November 18 – December 15 since it will give you two weeks prior to and after the presumed Organic Reach drop. While I really don’t care about Organic Reach on a post-by-post basis, we’re going to check it anyway. It’s likely this number has dropped for you, but this is not the case for everyone. 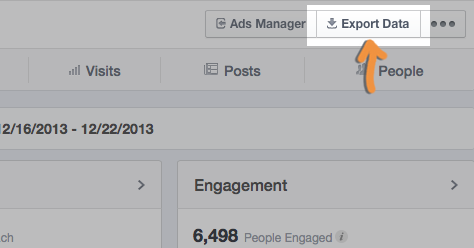 Column I of the Key Metrics tab (the default view) will provide your Organic Reach data. Let’s go to the very bottom of that data and find the median Organic Reach for November 18 – December 1 and December 2 – 15. I use medians so that your data isn’t easily swayed by numbers that are well outside normal range. In other words, this takes the ratio of the latest two week period over the prior two week period. Of course, these formulas need to be adjusted based on your data — the rows that apply to each date range will be different for you. To make this nice and easy, go ahead and copy these three cells and paste them across all columns in those rows. This way, you can get medians and changes for all data within Key Metrics very quickly. Now do exactly what you just did, but within the fifth tab for Consumptions. This time, you’ll want to find the difference between time ranges for each type of Consumption (Link Clicks, Photo Views, Video Plays, Other Clicks). Something to keep in mind here is that data now starts with Row 2 instead of Row 3. Otherwise, these formulas should be identical to what you used on the Key Metrics tab. If your goal is to drive traffic, pay especially close attention to Link Clicks! You should probably remove any rows of data that weren’t link shares for this comparison. It’s up to you, but you could also run this same process for specific Story types within the Stories or Talking About This tabs. This may be overkill, however, since you already found the general numbers earlier. I can’t show you how to do this since it’s deserving of a full blog post of its own (in fact, make sure to read this!). But, hopefully you are tracking revenue based on traffic sources. Compare your revenue for each date range to see if there has been any noticeable difference. Organic Reach: I’m showing Organic Reach is down 21.5% for me. An interesting note is that Viral Reach is down 63%. One reason I don’t trust Reach numbers generally is because of the misreporting of Viral Reach a year ago. I’m not saying that’s at play here, but something to consider. Stories and Talking About This: These numbers are flat. Whether looking at Fans or all data, each number is either just above or just below 100% of what it was the prior two weeks. Link Clicks and Referral Traffic: I show an interesting discrepancy, though it doesn’t necessarily mean incorrect data. There is a drop in median link clicks of 28%, but my Google Analytics show that Facebook referrals are up 20%. 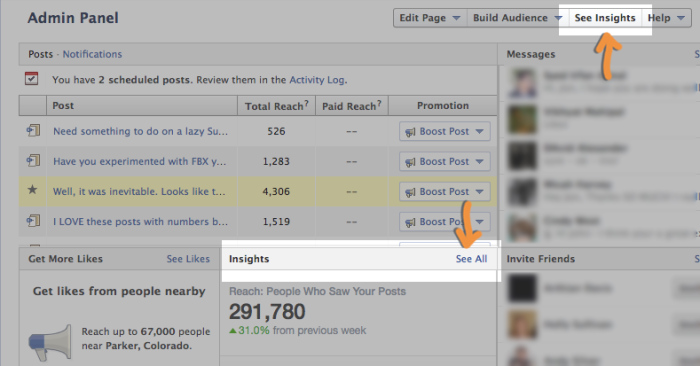 This doesn’t necessarily mean anything since not all referral traffic comes from my Page, but something to watch. Referral Revenue: My referral traffic from Facebook has resulted in nearly triple the revenue during the first two weeks of December. Even if I take out my Cyber Monday promotion, revenue was up 30%. Based on these results, you can probably see why I haven’t yet hit the panic button for my Page. Sure, I’m seeing a drop in Reach, too, but many of the more important metrics are either flat or up. Now, this is a great exercise. However, let’s be careful not to get too wrapped up in small sample size data. We’re looking at two weeks of data at a time here. Chances are pretty good that you see regular ups and downs. There are many factors at play, not the least of which is the amount you’re committing to advertising. However, I’d still much rather you do this than freak out about your Reach. Start doing this now if you weren’t already. Over time — particularly after the first of the year — let’s look again to see if any trends you were seeing during the first two weeks of December continue into 2014. Go ahead and run this exercise yourself. 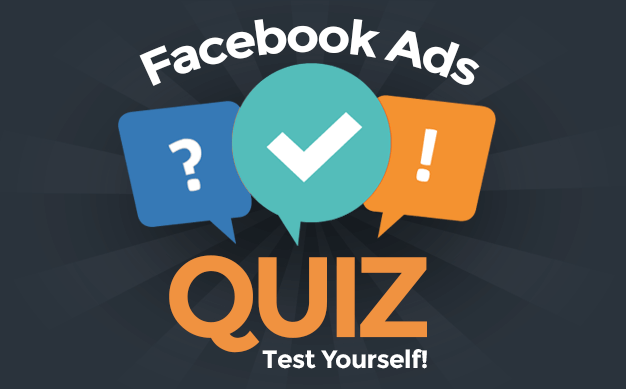 Let me know what results you’re seeing in the comments below!